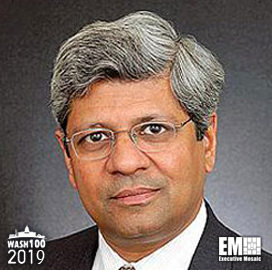 Executive Mosaic is honored to introduce Sudhakar Kesavan, chairman and CEO of ICF, as an inductee into the 2019 Wash100 — Executive Mosaic’s annual selection of the most influential voices in the government contracting arena — for leading ICF to great financial success and multiple contract awards in 2018. This marks the second Wash100 Award for Kesavan. ICF recorded $1.34B in total revenue for 2018, which is a nine percent increase from last year. The company said its contract award grew 40 percent to $1.82B and a total backlog of $2.4B for the year. Revenue for the fourth quarter rose by 18 percent to $378M. “Revenue growth in the fourth quarter was broad-based, across each of our client categories. Revenue from government clients increased 22 percent, driven by our disaster recovery work for state and local government clients,” said Kesavan. “At the same time, our year-end business development pipeline increased to over $5.8B, representing a year-over-year increase of 38 percent,” he added. ICF received a potential $214.2M contract in late 2018 to provide support services for the U.S. Agency for International Development, update tools and the methods used to collect population, health and nutrition data throughout the country. ICF also received a separate $120 million task order to help USAID’s Bureau for Global Health develop infectious disease surveillance measures for lower and middle-income nations. The Federal Emergency Management Agency also picked ICF to help Puerto Rico’s government recover from hurricanes Irma and Maria in June 2018. The company received a $188.8 million grant to assist in the review of grant claims and planning of projects for disaster recovery efforts on the island. ICF is also helping the U.S. Army Research Laboratory in basic and applied research programs for the military under a $175 million contract. Sudhakar shares decades of experience in the consulting industry, where he led various efforts to analyze the economic impacts of regulations on industry in the U.S. and over 50 countries. Under his leadership, ICF has expanded its presence worldwide, with 60 offices established across the U.S., Europe and Asia. Executive Mosaic congratulates Sudhakar Kesavan and the ICF team for receiving this award.